Experience the pristine wilderness and diverse wildlife on one of Manitoba’s finest trails, Pinawa Trail. 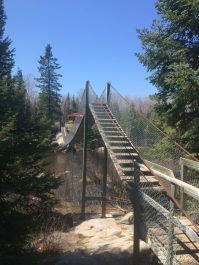 This 28-kilometre Trail section connects the community of Seven Sisters Falls with the Pinawa Dam Provincial Heritage Park, passing through mixed forest and granite ridges. Spend the weekend and discover the area’s fascinating Trail sections, as well as its incredible flora and fauna! Begin your multi-day journey at the Willis Drive Trailhead in Pinawa, before heading west. 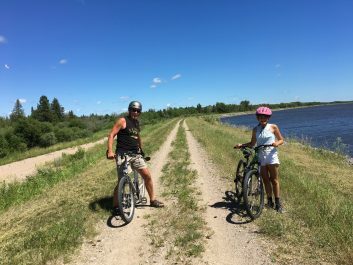 Less than an hour by bicycle from Pinawa, this trip is suitable for all ages and mountain bikes are not required. As you cycle, follow the trail markers to Seven Sisters. This well-maintained, single-track Trail section gives way to double tracks as you near the hydro dam. When the dam comes into view, take in the beauty of Natalie Lake on your left and pause to get a glimpse of pelicans, Canada geese, great blue herons, horned grebe, trumpeter swan and loons. Large numbers of migratory birds often gather here in the spring and fall. 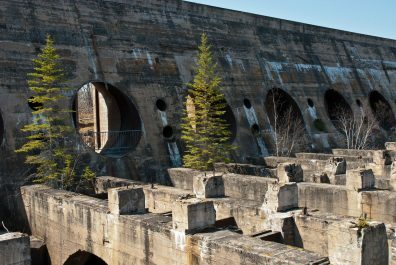 The trail passes over the Seven Sisters Hydro dam, one of Manitoba’s oldest operating hydro dams, and offers a spectacular view of the spillway. On the far side of the dam, you may be ready for a snack in one of the many fine restaurants in Seven Sisters Falls. Cycle through the quaint “hydro town” until you reach PR 307. Here, you’ll find Jennifer’s Restaurant-Picnic, a family-friendly restaurant that’s famous for its schnitzel burgers. If that hearty meal makes you hungry for more adventures, visit the beautiful Whitemouth Falls Provincial Park before returning to Pinawa Trail. The park can be accessed from the trailhead across from Jennifer’s Restaurant-Picnic. In the spring and fall, migrating pelicans amass at the rapids here. Some of these pelicans stay all summer long! After breakfast, slip into your hiking boots and get ready to explore the town of Pinawa and its beautiful riverbank. In 1963, Pinawa’s town planners decided to preserve the entire riverbank as a public space. 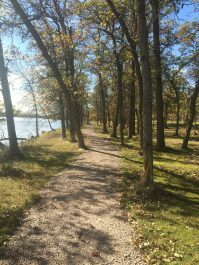 That initiative helped to protect the Ironwood Trail, a part of the Pinawa Trail that follows the Winnipeg River. This hike combines the beauty of the Ironwood Trail, some of the Alice Chambers Trail, the Pinawa Suspension Bridge and the Heritage Trail. Begin your hike at the trailhead sign at the public beach, and discover the community of Pinawa from the scenic vantage point of the riverbank. Beaver or otter can often be spotted in the water. Notice the trees wrapped with chicken wire? Local volunteers are saving them from the beavers, who like to use the trees to make their dams. Wildlife enthusiasts will also be delighted to see waterfowl nesting in the reeds along the shore, turtles, which are known to lay eggs right beside the Trail, and deer. 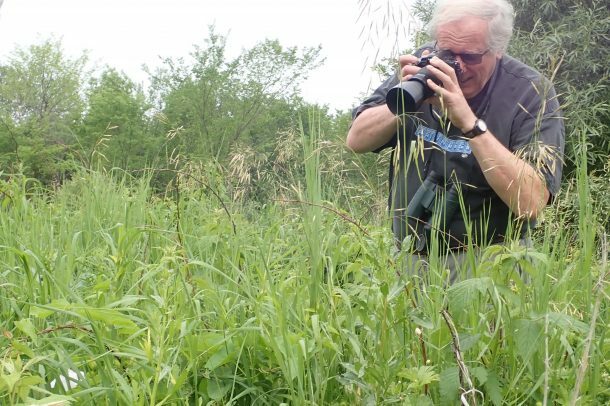 Besides being a valued habitat for many species of wildlife, Pinawa is also a haven for artists. Along the Trail, you may find hidden wood carvings, painted rocks and even pottery discreetly adorning Pinawa Trail. As this Trail section turns north and is about to leave the river’s edge, scan the treetops on the far shore – you might spot an eagle’s nest! Continue to follow the Trail signs for the Suspension Bridge. The bridge, built in 1998, was designed and constructed completely by local volunteers. It spans the Pinawa Channel and connects the Alice Chambers Trail to the wild and wonderful Heritage Trail. Once across the Suspension Bridge, the Trail plunges into Canadian Shield wilderness. If you don’t see a Trail sign, follow the cairns when you climb over granite outcrops. Keep an eye out for bears, porcupines, marmots, fox and grouse. Foragers will also find a smorgasbord of wild food on this section: several varieties of edible mushrooms, fiddle heads, blueberries, saskatoons, wild raspberries, chokecherries and more. The Trail emerges at the Diversion Dam via Larry’s Arch. Cross the dam and hike briefly up PR 211. The route home follows the tenth hole of the golf course back to the Pinawa Club and the beach. The Pinawa Club Restaurant is an excellent place to enjoy refreshments and a meal after the hike. Along Pinawa Trail, you’ll find a water access point that connects you to the history and beauty of this special area. This narrow waterway links the original town of Pinawa with the ruins of Old Pinawa Dam, the first hydroelectric generating station in Manitoba. During the construction of Old Pinawa in 1905, this water channel had to be widened and deepened. A crew blasted through the granite, and used a team of horses to pile it along the shore. The results are the high rock walls you see today. The channel has become a popular tubing destination. If you enter at the Diversion Dam, you can relax and enjoy a two to three-hour leisurely float to the Suspension Bridge. Several local companies provide support with tube rentals and transportation, including Eduvacay and Wilderness Edge. Kayakers and canoers continue past the Suspension Bridge, leaving civilization behind. While you manoeuvre the gentle rapids, watch the shoreline for deer coming down to drink the water or to play in the reeds, turtles sunning themselves on the rocks and a myriad of ducks and marsh birds. Wild rice grows along the water’s edge. A couple of hours into the paddle, a set of rapids on the right can either be manoeuvered or avoided with a short portage. As you near Old Pinawa, the terrain on shore changes, from forest and marsh to tall prairie grass. When the ruins come into view look for the final pullout on your left. Don’t overshoot it, as falls at the dam are treacherous and should be avoided. Old Pinawa is an excellent spot for a picnic on the rocks, so make sure to bring a packed lunch with you. Don’t leave without hiking the self-guided interpretive trail that takes you through the historic ruins. 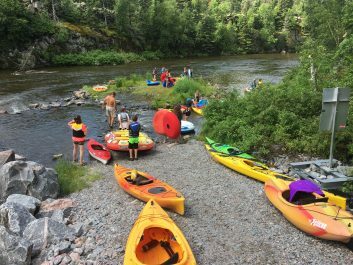 Wild Harmony Canoe Adventures can provide equipment, guides and logistics. The Staff House B&B in Seven Sisters is an ideal base for your Trail adventures in Pinawa. This beautifully restored heritage home is just a few steps away from The Great Trail, and also features a yoga studio for the perfect wellness retreat. Pinawa is located 115 kilometres northeast of Winnipeg via highways 59 north, 44 east, 11 north and PR 211.